On a cold stark February day Laura Leigh, founder of Wild Horse Education (WHE), met journalist Dave Phillips at the Stone Cabin roundup outside Tonopah Nevada. Leigh was “doing her thing” monitoring handling and assisting with a trap site adoption event. Phillips was a journalist hungry for a story. During the roundup Leigh won a massive legal victory in the Ninth Circuit Court of Appeals toward gaining access through First Amendment issues at roundups and government holding facilities. The case was joined through the filing of Amicus briefs by multiple press interests throughout the country. During operations Leigh and Philipps had extensive conversations. Philipps was there as Leigh received death threats and websites were created to “destroy” her work. He watched as she drove her beat up Explorer, that was literally held together by duct tape, obeyed every absurd rule with patient calm and documented everything she saw. He participated in friendly conversation with Leigh and Bureau of Land Management (BLM) employees, where at times both parties seemed to “finish each others sentences” about protocol, policy and management. Philipps was intrigued. What grabbed this young journalists attention was the BLM “sale program.” The BLM maintains an adoption program but also sells wild horses for between $10-$25 each in bulk. Leigh and Phillips kept in touch. Later that year ProPublica published a scathing expose penned by the Pulitzer Prize nominee, Philipps. 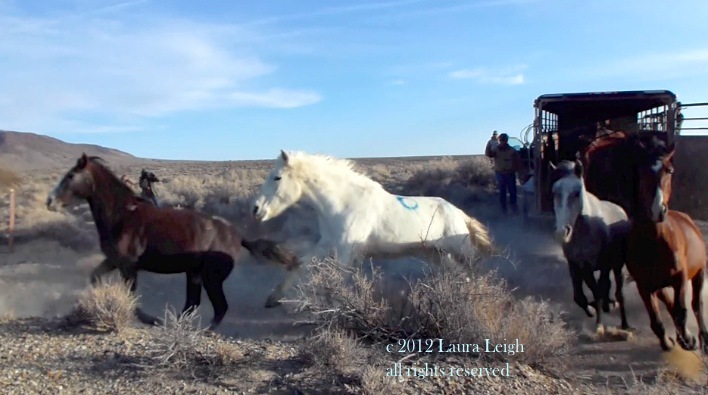 The piece discovered some of the “tangled web of slaughter” faced by wild horses captured by the BLM. In one instance more than 1700 wild horses went to one kill buyer alone, Tom Davis. It was discovered that Davis had a “relationship” with former Secretary of the Interior Ken Salazar. Philipps eventually earned himself a threat of a “punch in the face” from the former Secretary at an election campaign stop in Colorado. (We have always wondered what other threats Philipps may have received). Watch an Interview with Philipps on Democracy NOW below. As a result of this investigation BLM claimed to “tighten up” the sale program and an investigation into the activity that violated policy on selling that many wild horses to Davis was begun. As of the writing of this piece there has been no official word on the results of any investigation. Although shortly after the incident where Salazar threatened Philipps, the Secretary of the Interior resigned. At this moment there is another proslaughter public relations campaign designed to “destroy Leigh” and threats against her have increased. This most recent propaganda machine was sparked by events at the Fish Creek HMA in the heart of Nevada. Another “investigation” is underway into ongoing activities at Fish Creek. We are actively pushing that this investigation not disappear into the political black hole. At Fish Creek Leigh was with another fiery journalist hungry for a story. This journalist writes for such publications as National Geographic. This journalist has also been talking to Leigh since February of 2015.